As previously reported, in February, a judge with the Oregon BOLI declared Aaron and Melissa Klein of Sweet Cakes by Melissa guilty of discrimination for declining to make the cake, thus moving the matter into the sentencing phase. But according to reports, the damages were paid on Monday, as the couple dropped off a check for $136,927.07, which includes interest. Neither the Kleins or their attorneys released a statement about the matter as of press time. 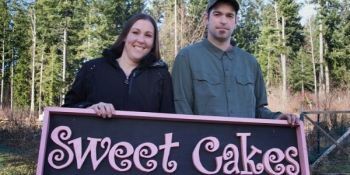 The order from BOLI outlines that the complaint form that one of the women completed included a disclaimer noting that once submitted, their information would now become “subject to Oregon’s public records law.” This means that the personal address and phone number that was supplied might be able to be seen by the public and Aaron and Melissa Klein of Sweet Cakes by Melissa. Serious times we living in now where the gays bloody well have more rights than the rest of us who won't condone nor accept their lifestyles. How is it that gays can talk down to anyone who don't share their way of life, get upset that we don't & won't, look at us like something's wrong yet we must accept and swallow their behavior. They can't respect us for our views but we must of theirs. The world gone completely mad. Completely mad is correct, and it will get worst just wait and see. Please reflect and seek a spiritual healing from God. He will do wonders for your soul. It is obvious that you fear him which in itself speaks to your inability to deal with HIS existence. But the more you wiggle the deeper you will fall into his graces and there is not a thing you will be able to do then, but accept GOD for who he is...GOD of the Universe!!! Let the Church say AMEN!!! not like them to be eradicated. They can't get along with others because it is they who are defective and evil.